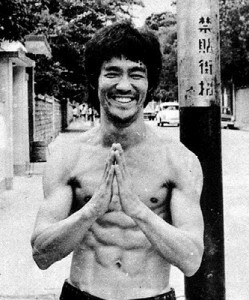 Influence of Yiquan on Bruce Lee, by Bernard K.
Never be a low class street fighter, try to read more theoretical books, books on Chinese culture, raise your standard, be polite, be humble and exercise forgiveness. Improve your level and become a master. Learning martial arts is to improve one’s own conduct. Try to feel the movement of the flow of Qi, the twisting of muscle, stretching of the limbs. Stand to explore one’s spirit and strengthen your body, do not think of fighting for the whole day. Only when your muscles can relax and be soft, then can you explode in a very short moment with fast speed and strong strength. If your muscle is hard, these will impede your movement and speed. Bruce’s previous experience in the martial arts was with striking arts. He never conceived that with soft power, his teacher could throw a person easily to the wall. This could only be achieved when he keeps a non-collapsed structure, with a strong frame and relaxed muscle, which can explosively burst with speed or power. These scenarios are always seen in Bruce’s movies, when he kicks or punches his opponents and they are always thrown away and their bodies hit the wall. Bruce’s previous experience was to use hand movements to strike. However, Yiquan’s emphasis is on whole body power. With a strong skeleton like a tank, and opponent that attempts to block the attack will be thrown away entirely. The damage is horrible. Yiquan’s combat theory is to hold a static stance, watching you with the eyes and being quiet in movement. Once you move, he covers you , controls you and intercepts you before your power can be extended and burst out. These theories are similar to most of Bruce’s theories in his system of Jeet Kune Do. Also these fighting strategies are always shown in Bruce’s movies. Extend your hands to shut out and block opponent’s attack. Do not shrink and let your skeleton collapse. You must fully extend your hands. Mr. Liang liked to sound out with his sudden explosive strength. This is common in northern martial arts and was widely used by early Yiquan practitioners. Liang showed different sounds when he moved his body up and down, forwards and backwards quickly. When he pushed or punched others, he issued a sound so that his opponent was shocked and thrown away. In most of Bruce Lee’s movies we can see he employed this technique. Yiquan techniques are simple; every move is real, useful and effective. They are developed from numerous fights. Fighters must be trained to keep balance while moving, maintaining the frame while rushing in or retreating, keeping full speed, maintaining enough explosive strength, flexibility and co-ordination and a keen mind to win. Only when the fighter can use all the mental and physical factors thoroughly can they win. Posted 16th November 2011 by Bernard K.